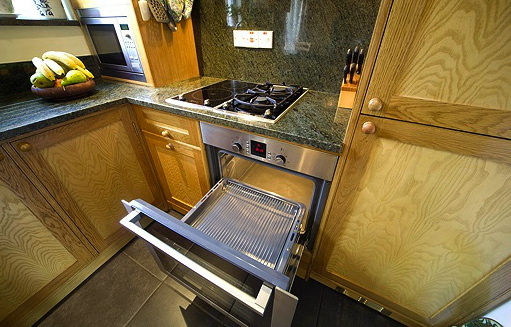 The lady for this kitchen had a dexterity impairment, and was looking to improve the functionality of her kitchen as she’d been struggling with it for years. 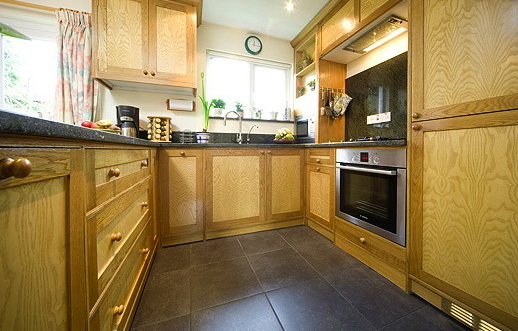 The brief was to remove the old kitchen, and replace it with fully integrated appliances and all the mod-cons. Fridge/freezer, dishwasher, oven & extractor, gas & halogen hob, microwave, washing machine, double sink, mixer tap and filtered water tap. There was also a boiler in the kitchen that was to be hidden from view. In the dining area adjoining the kitchen was a wall-hung oak panelled cabinet; the client expressed a desire to build the kitchen to match the oak cabinet, and a stone work surface throughout. A simple brief, but in order to meet her specific needs, as she was without the use of her right hand, there was a lot to consider. Design a space that incorporated all the appliances without sacrificing practicality or good ergonomics. Source an oven, water taps and other appliances that was sympathetic to her disability. Encase the boiler and integrating it within the design. The small base unit on the left hand side of the sink, comfortably housed the pullout kitchen bin. 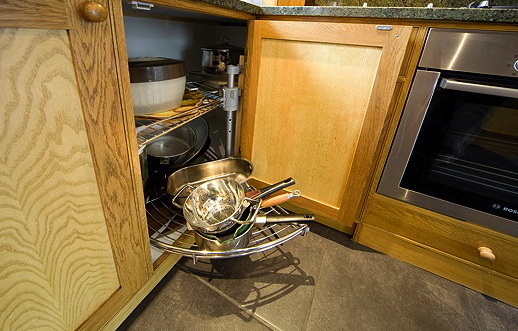 Below the cutlery draw, a concealed middle drawer was fitted above a high fronted pullout draw. The work-top, up-stand and splash-back was created in imperial green granite. ​Boiler. 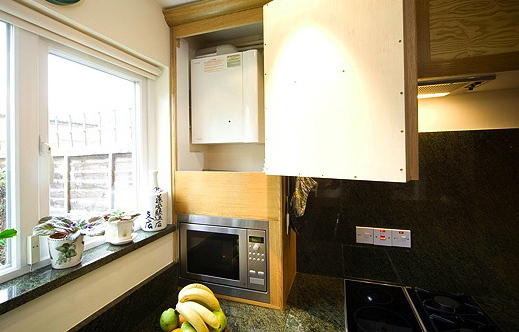 Using the space below the boiler casement to fit the microwave oven. ​Fitting the washing machine. 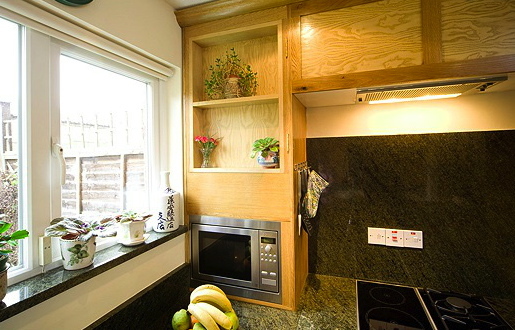 It was an open kitchen and dining area, therefore it made good sense for the washing machine to occupy the otherwise awkward space of the corner cabinet, facing into the dining area. Its neighbouring cupboard being only 200mm wide also faced into the dinning area to house the washing detergents. Draws. Taking advantage of Blum’s premium quality drawer actions we created a 900mm long draw casement to house most of the kitchens china. Again making the access to the area easier for the client. A semi-circular corner carousel was installed to the corner cupboard.